This week an international team of scientists have embarked on a shipboard expedition to study how the Earth’s crust was pulled apart in an area beneath the Atlantic Ocean off the coast of Spain. 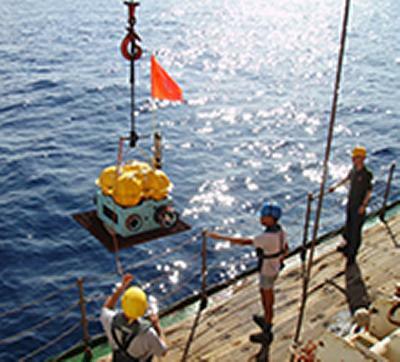 The team includes geophysicists from the University of Southampton based at the National Oceanography Centre, Southampton (NOCS). From research vessels RV Poseidon and RV Marcus G. Langseth, the team will use sound waves to create a three-dimensional picture of the rocks in the Deep Galicia Basin, located to the west of northern Spain. The new datasets will improve our understanding of how continents stretch and break apart, creating new ocean basins in between. Professor Tim Minshull, Head of Ocean and Earth Science at the University of Southampton, who is leading the Southampton team aboard the German vessel RV Poseidon, says: “We first conceived this project almost nine years ago, so after many years of preparation it is exciting to finally be doing the experiment.” The team will drop 78 seismic detectors onto the seabed in cooperation with colleagues from GEOMAR, NOCS’ German counterpart. Led by Professor Dale Sawyer of Rice University, scientists aboard the US vessel RV Marcus G. Langseth will then image the Earth’s crust in three dimensions over a 64 x 22 kilometre region of the ocean floor. Seismologists use sound waves to image structures below the sea floor in much the same way that ultrasound techniques image organs in the human body. The sophisticated seismic instruments aboard the RV Marcus G. Langseth will allow seismologists to build up a picture of the faults and continental blocks up to 15 kilometres below the sea floor. Pressure guns towed behind the ship produce sound waves that penetrate the rocks and bounce off fault planes and boundaries. The reflected sound waves are then recorded by the detectors on the sea floor as well as instruments called hydrophones that are towed behind the ship. The scientists are particularly interested in a strongly reflective fault surface – known as the “S reflector” – as well as the structures above and below it. This fault is thought to have formed when the crust was pulled apart. It is the boundary between the overlying crustal blocks and the underlying mantle rocks that have been penetrated by seawater. The scientists will also use the seismic images to work out how and in what order the different blocks moved as the crust was stretched. In addition to Professor Minshull, University of Southampton participants include Dr Gaye Bayrakci aboard the RV Poseidon and Dr Marianne Karplus aboard the RV Marcus G. Langseth. Also aboard RV Marcus G. Langseth will be scientists from the University of Birmingham, Rice University (USA), Columbia University (USA), the Institute of Marine Sciences in Barcelona (Spain) and the University of Aveiro (Portugal). Professor Jon Bull (SOES) is involved with cruise planning and data analysis, with particular focus on imaging faults and determining fault behaviour.